If you've ever been in a situation where a little more light would come in handy, but the nearest power point is nowhere to be found, then Mighty Bright lights are just what you need. View our range of Craft Lights and Handheld Lights below. Mighty Bright Lights are portable and light in weight. Being compact in design, they will easily fit into your kit bag and being durable, a small knock will not break them. Mighty Bright Lights use LED lights, meaning that they will provide an even bright light to your work area. The light is spread over a wide area, unlike conventional lights where the light is concentrated in a central area, dulling as you move out of the centre circle. Also, on average, the globes will last 20,000 hours! The Mighty Bright Lights are powered with common batteries. You won't need to go to any speciality stores to find replacements, your local supermarket or shopping centre will be able to supply replacement batteries. However, don't buy any batteries at the start, as every Mighty Bright Light comes with batteries. Simply taken the batteries out of their plastic casing or remove the discharge protection tab and your Mighty Bright Light is ready to use! The XtraFlex 2 Craft Light has a flexible arm that allows the light to be shined at the desired angle onto your project. It has 2 lights within its head that provide a beautiful even light. To conserve battery life, one light can be turned off whilst in use. The base has a padded alligator clip allowing the XtraFlex 2 to be fastened onto your project without damaging it. Weighs only 130 grams. Available in Silver or Purple. The Vusion Craft Light has 2 independent flexible arms, one with a light and the other with a 2x magnifier. Bend the arms at the desired angle for use. The lighted arm has 2 lights within its head that provide a beautiful even light. To conserve battery life, one light can be turned off whilst in use. The base has a padded alligator clip allowing the XtraFlex 2 to be fastened onto your project without damaging it or alternatively keep it within its magnetic stand base and attach the light to any metallic surface. Weighs only 275 grams. Available in Silver or Purple. The Portable Sewing Machine Light has been designed to work with your sewing machine.The light will illuminate hard to see threads, dark fabrics and make matching seams a much more enlightened process. Simply anchor the detachable cradle of the light onto the sewing machine using the double sided tape that comes with the light and then slide the base of the light into the cradle. Move the flexible 14cm neck of the light to the desired position. Have bright, clear light shining at any angle onto your work. The Mighty Bright Sewing Machine Light runs on one AAA battery (included within the pack). Available in Silver only. Running around all day? Too many things to do and not enough hours in the day to get it all done? And where are my glasses? 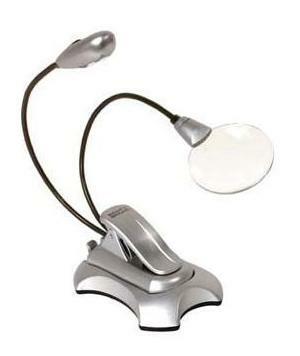 Try the Lighted Pendant Magnifier. 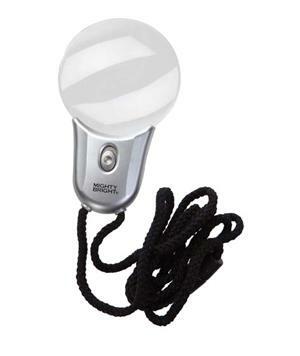 With its 2 inch lighted lens with 3 times magnification, this light weight portable light is handy at any time. Its uses are endless. The neck strap shown is included. 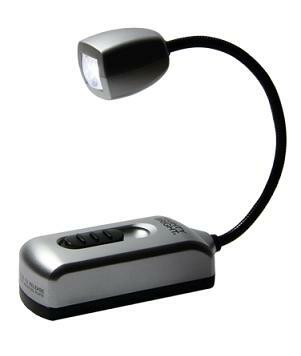 The Lighted Pendant Magnifier uses 3 watch batteries, which come with the pendant. Available in Silver only. Isn't it always the case that those annoying mistakes always happen in the most awkward spots – hard to see, difficult to reach. The Lighted Tweezers make it easier to find and fix those little mistakes. With just one hand, you can magnify (up to 4 times) and see what you are doing with a nice bright white light shining just where the light is needed most. 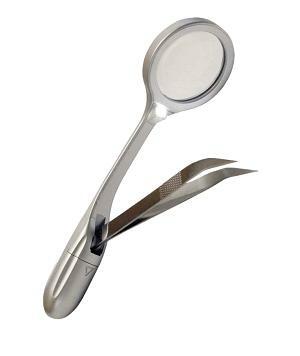 The magnifying lens is 1¼ inches (just over 3cm) in size and the tweezers are 5½ inches (approximately 14cm) in length. Using 3 watch batteries (included), the Lighted Tweezers are light in weight. Available in Silver only. The Lighted Seam Ripper is a must have item. It makes unpicking threads all so easy, especially when working on dark fabric with dark coloured threads in awkward or far reaching places. The light shines onto the seam ripper tip and the magnifier enhances the area up 4 times. The seam ripper swivels and it adjustable up and down, making it perfect for left or right handed work. The magnifying lens is 1¼ inches (just over 3cm) in size and the seam ripper are 5½ inches (approximately 14cm) in length. Using 3 watch batteries (included), the Lighted Seam Ripper is light in weight. Available in Silver only.